Malik Shehan Ashraf, Huawei Sri Lanka Senior Manager Enterprise Solutions, EBG & Carrier IT – presents Huawei Enterprise Solutions. Huawei, a leading global information and communications technology solution provider, recently hosted first ever Huawei IT congress in Sri Lanka themed ‘Huawei Lanka IT Congress 2018 – Intelligent IT Inspires Digital Future’. The event showcased Huawei’s commitment to partners and desire to contribute to the Sri Lankan ICT ecosystem and Digital Transformation, bringing together over 500 senior management personal across leading partners, and from companies from a number of sectors including IT & ICT, Banking & Finance, State sector key public organizations. The event witnessed Huawei presenting technologies, IT technology trends, in-depth insights into the industry, introduction to Huawei’s latest IT solutions and Huawei’s technological innovations in the field of ICT. The event provided an ideal opportunity and a platform for all IT and ICT industry participants in Sri Lanka to communicate and share, inspire each other and also jointly explore the success of the digital transformation. The event also saw IT and ICT heads of public and private sector organizations engage in discussion on how to achieve digital transformation through creating new opportunities that boost efficiency, and embracing platforms that are open, agile, and equipped with state-of-the-art AI capabilities. 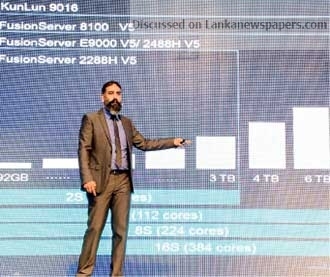 Addressing the event, Chief Executive Officer of Huawei Technologies Lanka Shunli Wang went onto say that “Through this congress, Huawei had the opportunity to engage with all participants in the IT and ICT industry in an open and constructive dialogue about Digital transformation in Sri Lanka and how Huawei the other organizations could work together with its comprehensive IT product portfolio to get the optimal benefit of the transformation”. He said that Huawei help organizations and industries go digital by providing them with open, flexible, and secure ICT infrastructure platforms that promote greater synergy between devices, networks, and the cloud. Further assuring on company’s support towards Digital Transformation CEO Shunli Wang said “With strong industry initiatives, skilled workforce, and forward-thinking governance, Sri Lanka could get assistance from Huawei and company’s local partners that is already helping to turn industries to digital transformation as a driver for growth”. He further pointed out that Digitization is gaining momentum around the globe and investment in cloud computing is ramping up on a regional and national scales, whilst ICT infrastructure is now an important pillar of national economic growth.